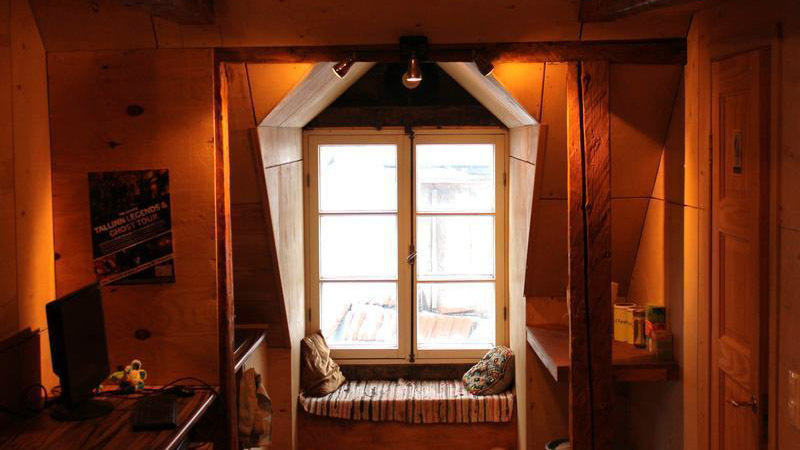 We’ve made a list of all the best hostels in Tallinn so you can rest your pretty head in the city’s most awesome beds. You’re welcome! Of the three Baltic capitals, Tallinn is easily the quirkiest. With its restored Old Town full of medieval-style restaurants and waiters dressed like maidens and knights, the city does have a bit of a theme park feel to it. It might not be particularly authentic, but hey – how often do you get to star in a real-life version of Game of Thrones? So embrace the nerdiness, good backpacking lords and ladies, and go exploring the streets of Estonia’s capital city. And when you’ve had enough of the tourist hoards in Old Town, you can go for a ridiculously mind-blowing stroll through the haunting Patarei Prison or check out Tallinn’s famous nightlife aka engage in some serious binge drinking. 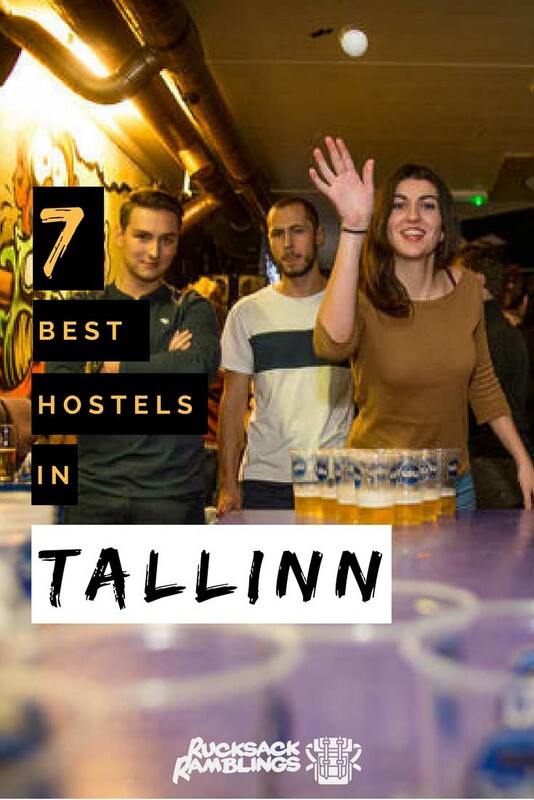 Either way, chances are you’ll be needing a bed to pass out in at some stage, and that’s where this list of the best hostels in Tallinn comes in handy! 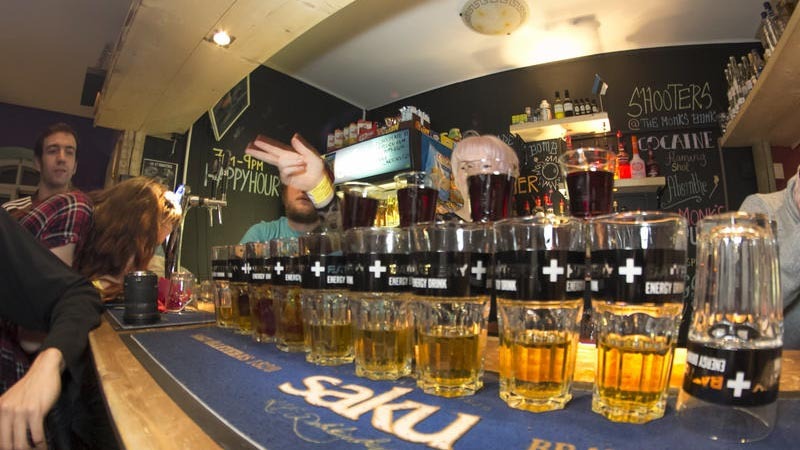 Tallinn has an impressive selection of party hostels and The Monk’s Bunk is among the top picks. Located within walking distance of all the main sights, bars, and restaurants in Old Town, fun is never far away here. You’ll get a welcome shot at check-in and from there, it’s full steam ahead. The staff goes above and beyond to make sure you have an awesome time and there’s usually some sort of activity on every night. Whether it’s a home-cooked hostel dinner or a beer pong tournament, you’re guaranteed to meet heaps of lovely little backpacker buddies. There’s also a fully-equipped kitchen and the facilities are super clean, especially considering the amount of partying that goes down at the Monk’s. And if regular sightseeing gets a bit mundane, you can take your pick between some pretty cool adventure tours run by the hostel – how does shooting a few AK47 rounds sound? You won’t be getting much sleep here, but if you’re after some good old Tallinn nightlife fun, The Monk’s Bunk is your spot! 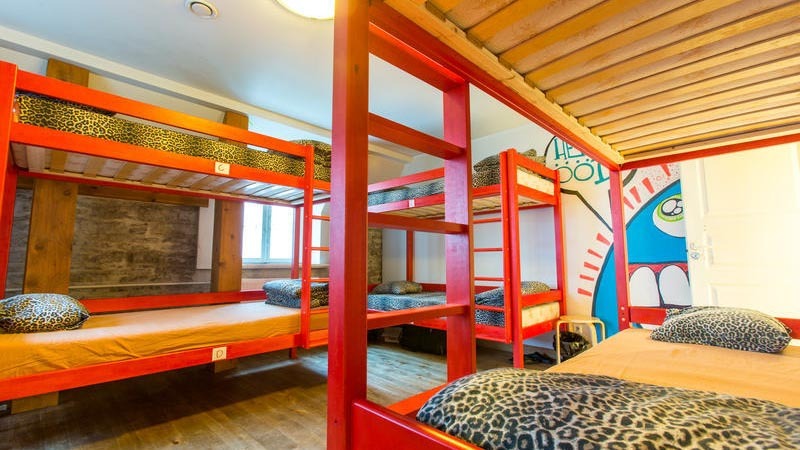 Now, if you want to party but also don’t want to miss out on your 12-hour beauty sleep, Tallinn Backpackers is more up your alley. With quiet time kicking in at 11 PM, it’s less full-on than The Monk’s Bunk, but don’t worry – there’s still plenty of fun to be had here. These guys supposedly have the cheapest beers in Tallinn and there’s a pub crawl happening most nights of the week. There’s also a wide range of tours available and, as a cool bonus, the staff is happy to share local tips on how to experience a not-so-touristy side of Tallinn. 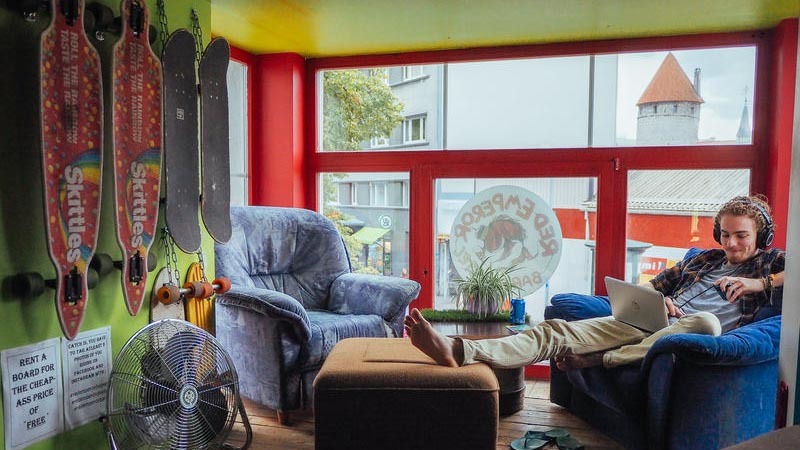 The atmosphere is social and homely without being boring which, together with the friendly staff, makes Tallinn Backpackers an excellent choice for solo backpackers. On the downside, there’s a little too few showers and the decoration is on the simpler side, but all that is secondary when the vibe is this nice. Oh, and there’s home-cooked meals available every night – yum! Not really in the mood for getting shitfaced? No worries, we’ve got just the spot for you. 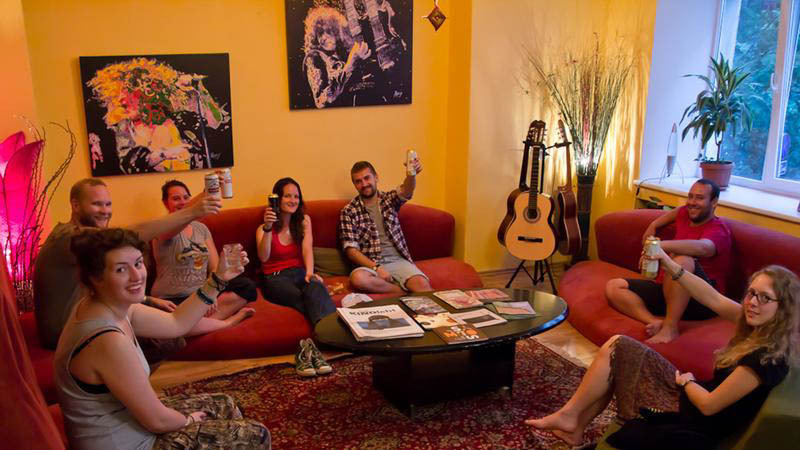 Euphoria is a cosy and edgy home away from home that’s perfect for the backpackers that honestly can’t be fucked going out every night. From the colourful graffiti on the front door to the Sunday night open jams, this place easily stands out from the crowd. Instead of beer pong tournaments and Fussball tables, you get workshops and live music. In fact, if you’re up for running a workshop yourself or entertaining with some sweet tunes, you can even stay for free! And the epicness continues. The common room is an oasis of chillaxing: there’s a hookah pipe, an awesome projector screen, a bar, and enough music instruments to make a musician cry. Channel your inner Dave Grohl at the drums or go for a Stairway To Heaven guitar solo – the sky (and your fellow guests’ pain threshold) is the limit! And if all the headbanging makes you a little peckish, you can smack together some grub in one of the three hostel kitchens. The only minus is the facilities which have seen better days and some wobbly beds but then again, would any self-respecting rock star care? 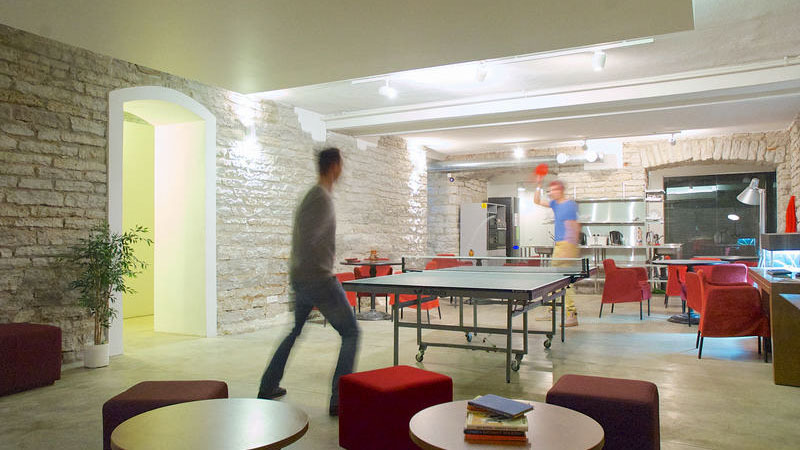 This is another of the best hostels in Tallinn when it comes to chillaxing. Old Town Backpackers is the oldest hostel in town and an excellent place to chill out for a few days. The place itself is teeny tiny with only one 6-bed dorm which moonlights as the common area. Yep, that’s right, your sleeping room is also your living room. Needless to say, this hostel isn’t ideal if you’re a fan of having your own personal space, but if you’re up for something different, the setup is pretty unique. Here, you’ll be making friends over a cup of tea, not over a pint. The vibe is cosy and, inevitably, quite intimate. There’s plenty of tours to choose from and the lovely owners have a few tips up their sleeve if you want to go beyond what the guidebooks recommend. As for the facilities, the place is well-kept and clean. On top of that, the kitchen is fully-equipped and just waiting for you to cook up some delicious Estonian-inspired meals. On the chillaxing side, we also have Tabinoya. This hostel is set in a charming Old Town building, giving it an authentic feel that many of the other best hostels in Tallinn don’t have. You won’t find the interior design in any recent Ikea catalogue (that’s a nice way of saying the place looks a bit dated), but that only adds to the cosy atmosphere. As for location, you’ll be in the middle of Old Town and close to the Kalamaja district where the local hipsters like to hang out. The dorms are fairly spacious, the facilities are clean, and there’s a fully-equipped kitchen. The free breakfast is basic but unlimited which means it’s pretty perfect for a budget backpacker. The only thing you need to look out for are the two flights of steep and narrow stairs up to the reception. The good thing is that after surviving that hike, you can jump straight in the hostel sauna – sore muscles, go home! All backpackers know it. You can’t have a city with cool nightlife without at least one Aussie party hostel or the universe will literally collapse into itself. The Red Emperor is pretty much a good old cookie cutter party hostel with all the ingredients for a great night out. It does the job so if binge drinking and late nights sound good, you’ve found your match. The hostel itself is spacious and inviting with bright wall art covering the walls of the dorms. 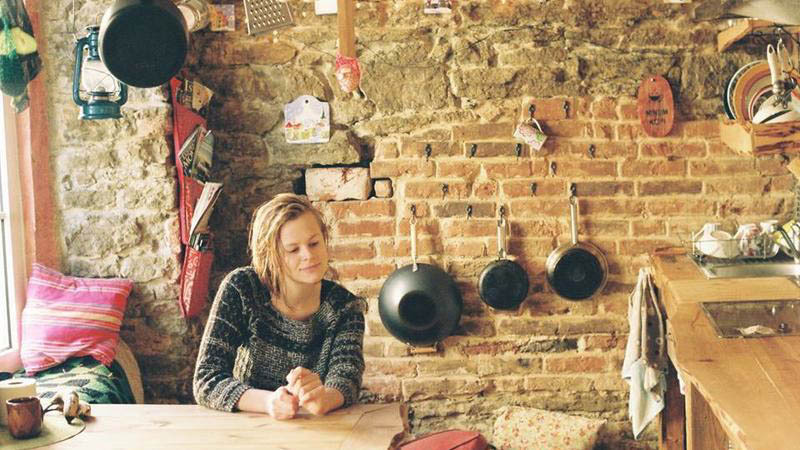 There’s a fully-equipped kitchen and every now and then, there might even be a home-cooked hostel dinner on the menu. In terms of entertainment, there’s a public bar attached to the hostel which means you won’t be dehydrating anytime soon. It’s pretty much the place to be during the week when the rest of Tallinn takes a break from partying and there’s quite often some sort of event on. The staff is, not surprisingly, fun-loving and can point you in the direction of some epic underground spots around Tallinn. The only major downside is that there’s no lockers in the actual rooms. Poor Margaret, hey? We don’t know about the whole fat thing, but we do know why Margaret’s is one of the best hostels in Tallin. Three words: indoor pool and sauna. Oh yeah, you heard us. If you block out all the other little backpackers staying there, it’s almost like you’re at a private spa. Not bad for a budget backpacker hostel! Sauna and pool aside, Fat Margaret’s is nothing fancy, but the rooms are clean and comfy and the location is spot on. You’ll be right at the gate of the medieval Old Town and within walking distance of the port. The kitchen and common area is welcoming and large enough for everybody to feel comfortable. There’s a bit of an issue with the showers running out of hot water but at least you can jump in the sauna to defrost. As if all of this wasn’t enough, there’s also something as rare as a free washing machine. Time to do some serious washing! Phew! Binge drinking, jamming sessions, saunas – whatever you’re after, one of these best hostels in Tallinn will have it. Start packing your backpack and get ready to rest your little head in some pretty awesome beds!